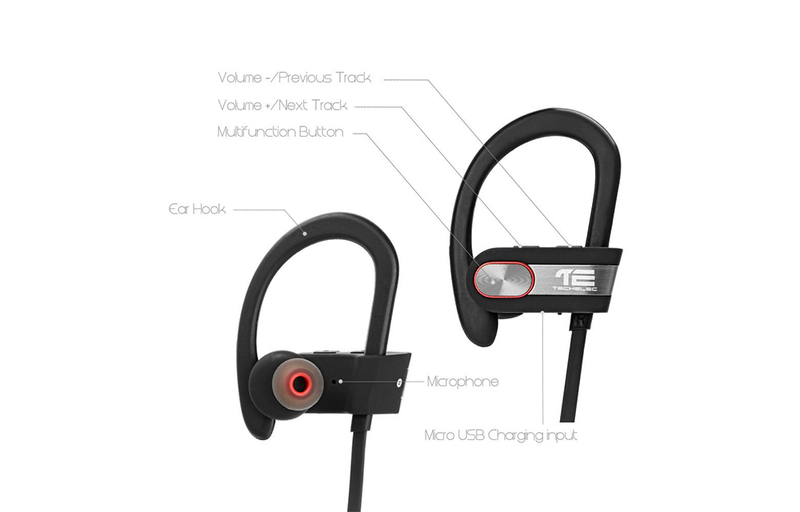 TechElec SP-X Sweatproof Bluetooth Headphone is a good quality product from TechElec, specially made for the Sports and Exercise purposes. The Sweatproof design of the headphone separates it from others in a unique manner. Nice design, Good sound quality and Great fit on the ears all make it a good product to enjoy some good music. The headphone is well fitting to the ears to provide a comfy feel even after hours of continuous usage. Comfort and sound quality are the two primary focus of the product, and it is enough to state it as a good headphone. The design of the TechElec SP-X Sweatproof Bluetooth Headphone is in an elegant way to provide maximum comfort to the users. The earpieces will comfortably stay in ears with the help of the soft silicone hooks that will be held by the ears. So, there will be no distraction while running long distances or while exercising for long. The TechElec SP-X headphone will stay dry without being affected by the sweat. So, that makes it easily usable by the sports loving persons and those who working out in the gym for long. From a single charge, the device can play 7 hours of music continuously without any charge drop. It can standby for up to 140 hours which makes it well compatible for the users who need long talk time frequently. 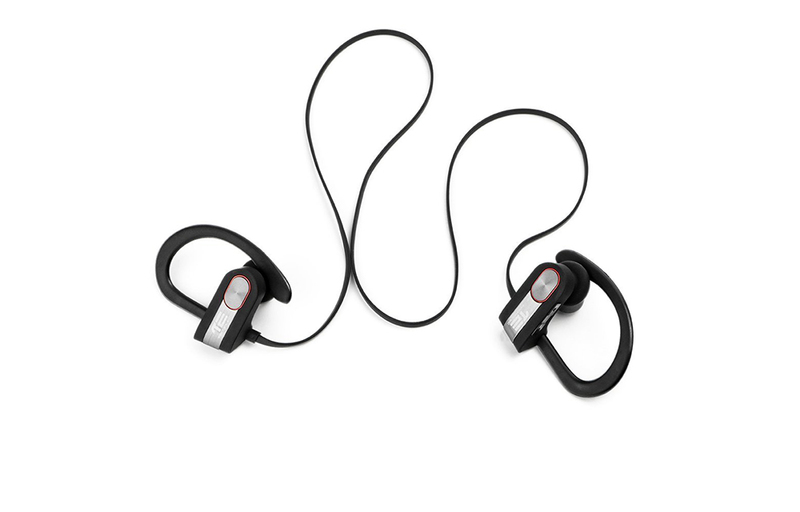 The two earpieces are connected with a small and friendly band that are well placed to give a nice feel while running without disturbing you. Having a beautiful design and small in size, TechElec SP-X Sweatproof Bluetooth Headphone is the best fit for the users. The advanced APTX technology lets you enjoy the crystal clear music without any noise and disruptions during the playback. The music will be well optimized for the ears and will protect the hearing without outputting high volume sounds. CVC 6.0 noise reduction technology on the device will considerably reduce the output noise by optimizing the settings to fit the environmental conditions. The earpieces are designed in such a way that to provide a problem free hearing that boosts the importance of the SP-X. TechElec SP-X Sweatproof Bluetooth Headphone can be connected from up to 15 meters away from your device with the help of Bluetooth 4.1 technology. The users could experience a barrier free connectivity all along their house without the blocks of the walls or doors. The device can provide the same quality throughout any distance that you have been connecting the headphone. There are no known compatibility issues with any of the devices including Smartphones, Tablets, iPhone or anything that are currently trending. There are several button of the ear pieces that can fulfill almost all needs of the users. The buttons can be used for various purposes including Volume up and Volume down, Next and Previous, etc… There is a dedicated multi-function button on the device to perform multiple tasks which will be very much helpful for the ease of use while playing the music. TechElec SP-X Sweatproof Bluetooth Headphone is a great product that can considerably boost the music enjoyment. The comfort and quality are the primary concern of the product, and it manages to deliver an excellent build quality too. It’s sleek in design and very easy to carry as it is tiny in size. The earpieces are well fitting into the ears and make no discomfort even after hours of continuous usage. Giving it a try may gift you a good device that can bring the music enjoyment to the next level. So, give it a try.